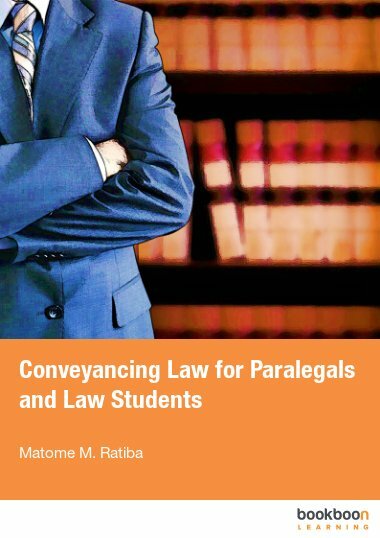 Matome M. Ratiba (BA (law) LLB – University of the Witwatersrand) - is currently a Senior Lecturer in property law at the University of South Africa. Between 1997 and 2006, he worked very closely with and rendered legal services to the legal department of Eskom (a SA parastatal entity). He has during that time published in the De Rebus lawyers' journal, and contributed commentaries to newsletters of both the South African Commuters Association and South African Estate Agents Affairs Board. In 2002 he was commissioned as legal adviser (property matters) to the team of forensic investigators appointed by the Housing Ministry and tasked with the investigations of irregularities in the national housing subsidy scheme. He also served as legal advisor to the City of Tshwane Metropolitan Municipality's Compliance Unit between 2004 and 2006. He has over the years read and presented papers at both international and South African conferences and colloquiums. He has also published extensively in both peer reviewed scholarly international and South African accredited journals.